This file photo taken in Rome on January 25, 2017 shows rights activists holding pictures of Giulio Regeni, an Italian student who was murdered in Egypt. 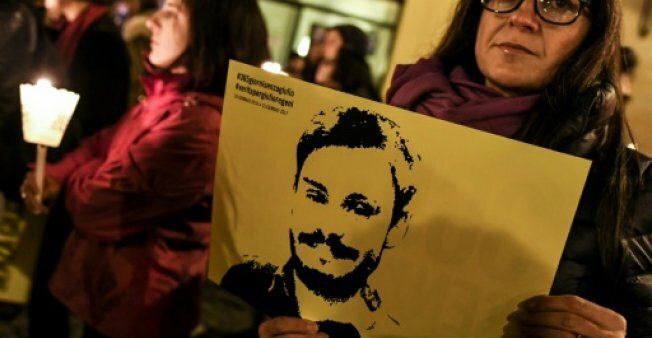 CAIRO - Authorities in Egypt have arrested a lawyer whose human rights group opposes enforced disappearances and is linked to one such case involving murdered Italian student Giulio Regeni, officials said Wednesday. Ibrahim Metwally was detained Sunday at Cairo airport on his way to the Swiss city of Geneva, where he was to take part in a meeting on enforced disappearances, his group said. Prosecution officials said he had been remanded in custody for two weeks on suspicion of "dealing with foreign parties" and "spreading false news". Metwally, who founded the Association for the Families of the Disappeared, was also suspected of having set up an "illegal" group, they said. Metwally had been in touch with the legal defence team of Regeni's family. Regeni, a PhD student, went missing in Cairo on January 25, 2015 and his body was found days later bearing torture marks. Egypt has faced accusations that one of its security services murdered the student who was researching trade unions -- a sensitive topic in the country -- but Cairo denied any such involvement. His murder led to a diplomatic crisis that saw Italy recall its ambassador, although it has since said its envoy would take up his post again. Rights groups accuse the Egyptian government of arbitrary arrests and enforced disappearances of dissidents that spiked after the military overthrew Islamist president Mohamed Morsi in 2013 and cracked down on his supporters. The government disputes such allegations. Authorities in Egypt have arrested a lawyer whose human rights group opposes enforced disappearances and is linked to one such case involving murdered Italian student Giulio Regeni, officials said Wednesday.